Morels are America’s mushroom , more so than any other. It may be because they’re widespread, they’re easy to identify, and they come up in the spring, giving people a reason to get out and enjoy warm weather after a long winter. Or, it could be they’re popular simply because they taste so good. Morels are so prized they sell for up to $20 a pound in grocery stores where I live. Here’s a quick guide to finding your own. 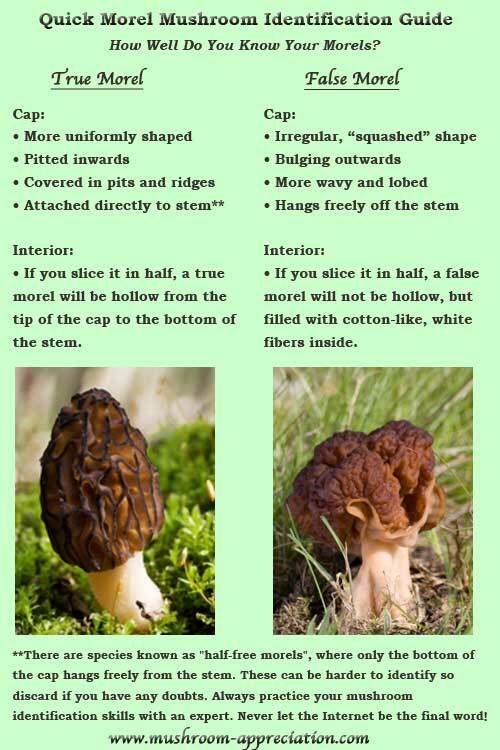 Please note that although morels are easy to identify, this a hunting guide, not a field guide. If you have any doubt about a mushroom, don’t keep it. Don’t eat this mushroom, which is a false morel and is mildly toxic. Notice that it lacks the cone shape of the real thing, and has wrinkles, not pits, on its cap. Morels live in and on the edge of forested areas. Look for ash, aspen, elm, and oak trees, around which morels often grow. Early in the spring as the ground is warming, you’ll find them on south-facing slopes in fairly open areas. As the season progresses, go deeper into the woods and onto north-facing slopes. Well-drained, sandy soils like this creek bottom make good hunting spots as well. You’ll find the first morels of the year when daytime highs reach the 60s and lows stay above 40 degrees. Morels often grow around dead and dying trees. Old apple orchards make good hunting grounds. Always look around dead elm trees like this one. When a tree reaches the stage of decay where its bark is slipping off its trunk you’ll often find lots of morels around it. As the season progresses you find bigger, yellow morels. They taste just as good as the smaller ones, they’re easier to spot, and it doesn’t take as many to feed a hungry hunter. Here you see morels sautéing in butter. Cooking in butter brings out their rich, almost meaty flavor. If I don’t have very many, I like to scramble them into eggs with some tarragon. Batter-fried morels are also very popular. Last Edit: 4 years 2 months ago by Memnoich. My wife went morel hunting a lot in Indiana. This should go without saying, but when you find morels, DON'T TAKE THEM ALL! Otherwise you won't have more next season. Some people don't get that. Lol that's actually a topic of controversy Jax. As the mushroom is the "fruit" of the mycelium, picking it all "shouldn't" affect the next years sprout. Make sure to collect in a woven basket or mesh bag to allow the spores to propagate. I know I would like to do more practical research into the use of mycelium with farming, as well as mushroom farming itself, for the Praxeum. Jedi 'Shrooms. She's seen this from experience. While doing it once may not make a big difference, people aren't that smart and they pick everything each time and before long good locations are not producing anymore. It's far healthier to leave some behind. She also added that when you find a good rotting log, break it up and sprinkle it on the ones you leave behind, giving them more food. She mentioned some other things but I forgot now. She's been morel hunting a lot in her life and learned quite a few things over the years. Great stuff! Did you take these pictures Mem? Nah this was from the article. I've also learned it depends on how you "Pick" them. For instance, "Picking" mushrooms is not recommended as the ripping them out of the ground damages the mycelium and can cause it to actually die, much like ripping the branches off a tree or bush. It's recommended that you actually cut the mushroom from the ground, leaving the roots intact. Much of the problems with morels comes from their high value. People make a lot of money by selling them to local grocery stores, and many have no actual knowledge of mushrooms, responsible harvesting, etc. So you end up with people just grabbing and going most likely. That aside, this is fun stuff. I'll check with my wife later about other tips she has for cultivating wild morels for future use. I do have a few books in cultivation and seeding myself. I believe last Fall, 60 minutes had a whole thing on morels and how the "supply" was -- the best from certain spots and 'faux' morels that are a lower quality but 'cut' into the mix to grab the big bucks and flood the market with 'cheaper' 'rooms.